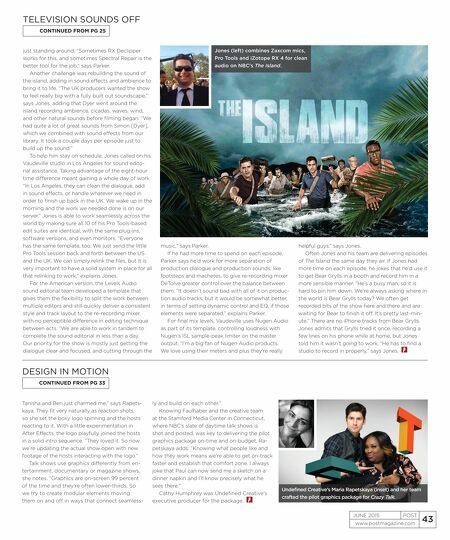 www.postmagazine.com 43 POST JUNE 2015 CONTINUED FROM PG 33 DESIGN IN MOTION CONTINUED FROM PG 25 TELEVISION SOUNDS OFF just standing around. "Sometimes RX Declipper works for this, and sometimes Spectral Repair is the better tool for the job," says Parker. Another challenge was rebuilding the sound of the island, adding in sound effects and ambience to bring it to life. "The UK producers wanted the show to feel really big with a fully built out soundscape," says Jones, adding that Dyer went around the island recording ambience, cicadas, waves, wind, and other natural sounds before filming began. "We had quite a lot of great sounds from Simon [Dyer], which we combined with sound effects from our library. It took a couple days per episode just to build up the sound." To help him stay on schedule, Jones called on his Vaudeville studio in Los Angeles for sound edito- rial assistance. Taking advantage of the eight-hour time difference meant gaining a whole day of work. "In Los Angeles, they can clean the dialogue, add in sound effects, or handle whatever we need in order to finish up back in the UK. We wake up in the morning and the work we needed done is on our server." Jones is able to work seamlessly across the world by making sure all 10 of his Pro Tools-based edit suites are identical, with the same plug-ins, software versions, and even monitors. "Everyone has the same template, too. We just send the little Pro Tools session back and forth between the US and the UK. We can simply relink the files, but it is very important to have a solid system in place for all that relinking to work," explains Jones. For the American version, the Levels Audio sound editorial team developed a template that gives them the flexibility to split the work between multiple editors and still quickly deliver a consistent style and track layout to the re-recording mixer, with no perceptible difference in editing technique between acts. "We are able to work in tandem to complete the sound editorial in less than a day. Our priority for the show is mostly just getting the dialogue clear and focused, and cutting through the music," says Parker. If he had more time to spend on each episode, Parker says he'd work for more separation of production dialogue and production sounds, like footsteps and machetes, to give re-recording mixer DeTolve greater control over the balance between them. "It doesn't sound bad with all of it on produc- tion audio tracks, but it would be somewhat better, in terms of setting dynamic control and EQ, if those elements were separated," explains Parker. For final mix levels, Vaudeville uses Nugen Audio as part of its template, controlling loudness with Nugen's ISL sample-peak limiter on the master output. "I'm a big fan of Nugen Audio products. We love using their meters and plus they're really helpful guys," says Jones. Often Jones and his team are delivering episodes of The Island the same day they air. If Jones had more time on each episode, he jokes that he'd use it to get Bear Grylls in a booth and record him in a more sensible manner. "He's a busy man, so it is hard to pin him down. We're always asking where in the world is Bear Grylls today? We often get recorded bits of the show here and there and are waiting for Bear to finish it off. It's pretty last-min- ute." There are no iPhone tracks from Bear Grylls. Jones admits that Grylls tried it once, recording a few lines on his phone while at home, but Jones told him it wasn't going to work. "He has to find a studio to record in properly," says Jones. Jones (left) combines Zaxcom mics, Pro Tools and iZotope RX 4 for clean audio on NBC's The Island. Tanisha and Ben just charmed me," says Rapets- kaya. They fit very naturally as reaction shots, so she set the boxy logo spinning and the hosts reacting to it. With a little experimentation in After Effects, the logo playfully joined the hosts in a solid intro sequence. "They loved it. So now we're updating the actual show open with new footage of the hosts interacting with the logo." Talk shows use graphics differently from en- tertainment, documentary or magazine shows, she notes. "Graphics are on-screen 99 percent of the time and they're often lower-thirds. 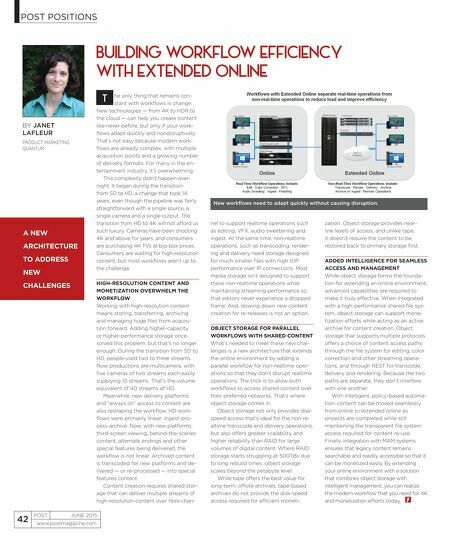 So we try to create modular elements moving them on and off in ways that connect seamless- ly and build on each other." Knowing Faulhaber and the creative team at the Stamford Media Center in Connecticut, where NBC's slate of daytime talk shows is shot and posted, was key to delivering the pilot graphics package on-time and on-budget, Ra- petskaya adds. "Knowing what people like and how they work means we're able to get on-track faster and establish that comfort zone. I always joke that Paul can now send me a sketch on a dinner napkin and I'll know precisely what he sees there." Cathy Humphrey was Undefined Creative's executive producer for the package. Undefined Creative's Maria Rapetskaya (inset) and her team crafted the pilot graphics package for Crazy Talk.